As part of trying world cuisine, we have landed at Nepal today. Nepal the land of Mount Everest. The Mountainous north of Nepal contains 10 largest peaks of the world, including Mt. Everest also known as Sagarmatha in Nepali. Lumbini, birth-palce of Lord Gautam Buddha is also here. So, what are we tasting from Land of Buddha today? Chatamari, served with Pineko golbheda achar or simply Tomato achar. Chatamari, refered as the Nepali pizza, is a traditional food of Newari people. It is topped with minced meat and eggs. Since we don't eat meat or eggs, i tried to top it up with mixed vegetable curry and served with spicy nepali style tomato pickle. There were 2 versions of this dish, one made with rice flour and another by sokaing rice and dal together and grinding it to make the crepes. I chose the later one and served it for dinner yesterday and for my breakfast today. It was a filling breakfast and that tomato achar is not be missed, as it adds a super zing to the dish. Wash Rice and dal separately with water and soak together for 8 hours. After the soaking time, drain the water well and take it in a mixer and grind it to a smooth batter. I used around 1/4 cup of water while grinding. Transfer the batter to another vessel, if it is very thick, add another 1/4 cup of water. I added that much to get a pourable consistency batter. Let the batter rest till the filling is ready. Peel and boil potatoes until soft. I used my Microwave's Auto-cook menu to cook the potatoes. Once done, drain and cool. Chop onion finely, heat a pan with 1 tsp oil, splutter mustard seeds, add cumin, hing and turmeric powder. Add chopped onions and saute till translucent. Next add green peas and frozen veggies and saute for 2-3 minutes. Next add cooked potatoes, followed by red chili powder, coriander powder and salt. Mix well and using a potato masher, mash it all together. Let this cook in a simmer flame, covered, for another 8-10 minutes. If you feel the masala's are burning, just sprinkle water 2 or 3 times to avoid that. Do not add excess water, coz we need a dry curry to spread on our chatamari. Once done, remove it from flame and keep it covered until use. Heat a pan for making the crepes, i used my cast-iron pan. Prep the pan, by smearing a tsp oil on it and wiping it well with a paper towel. Now take a ladle full of batter, pour it in the center, and spread it in a circular motion in the pan to make a pancake. Take care not to make it paper-thin or brick thick. Let it cook in a medium flame. Cook the chatamari only on one side. it took around 1 minute for the top to dry. Now spread 2 tbsp of filling on top of the chatamari, and let it sit for another 2 or 3 seconds. Remove the chatamari to another plate and serve it topped with pineko golbheda achar or simply tomato chutney. Do not miss the chutney, that is what makes this Nepali pizza, irresistible!!! This looks like masala dosa but the batter is not fermented. Looks delicious and chatamri topped with tomato achar is mouth watering. So similar to masala dosa. Amazing how there is so much similarity in cuisines. Exactly like our masala dosa, i can have a plate of this irresistible masala dosa and that tomato pickle makes me drool. And so Nepalis have a version of dosa with meat filling. Obviously there would be similarities with Indian cuisine owing to the geographical proximity. And still couldn't stop comparing it to our own dosas. :) I have seen in India, people who live in hot climates making dosas just fermenting the batter for an hour or so. And that achar must have been yummy. Wow, our dosa is their pizza. The mixed veggie filling looks amazing. Very filling and delicious dish. Oh wow this nepali pizza is something I would love to try some day :) the vegetable masala and the tomato pickle used is badly tempting me :) drooling here priya !! 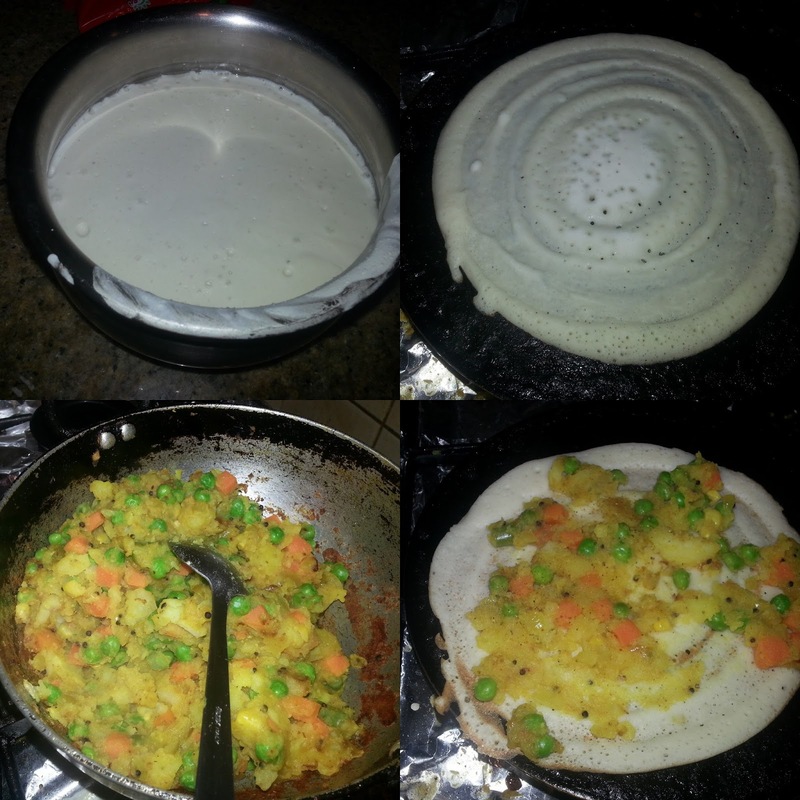 Looks amazing Priya..your way of plating dishes is awesome..
That looks like our dosa . I love the spicy potato filling. Wow! A Nepali dosa!! Your ability to research - too good! !